You can select the font type and its size, apply one of the decoration styles and change the font and background colors using the corresponding icons situated at the Home tab of the top toolbar. Note: in case you want to apply the formatting to the data already present in the spreadsheet, select them with the mouse or using the keyboard and apply the formatting. If you need to apply the formatting to multiple non-adjacent cells or cell ranges, hold down the Ctrl key while selecting cells/ranges with the mouse. Increment font size Is used to change the font size making it larger one point each time the icon is clicked. Decrement font size Is used to change the font size making it smaller one point each time the icon is clicked. Subscript/Superscript Allows to choose the Superscript or Subscript option. The Superscript option is used to make the text smaller and place it to the upper part of the text line, e.g. as in fractions. The Subscript option is used to make the text smaller and place it to the lower part of the text line, e.g. as in chemical formulas. Font color Is used to change the color of the letters/characters in cells. Background color Is used to change the color of the cell background. Change color scheme Is used to change the default color palette for worksheet elements (font, background, chats and chart elements) selecting one of the available ones: Office, Grayscale, Apex, Aspect, Civic, Concourse, Equity, Flow, Foundry, Median, Metro, Module, Odulent, Oriel, Origin, Paper, Solstice, Technic, Trek, Urban, or Verve. Theme Colors - the colors that correspond to the selected color scheme of the spreadsheet. 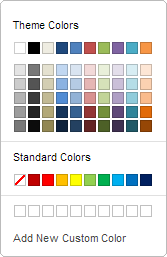 Standard Colors - the default colors set. The custom color will be applied to the selected text/cell and added to the Custom color palette.